In my restless wanderings throughout our nation I have always compared myself to the early American pioneer, forever moving on, each of us following our own dreams. But I wondered exactly what our early ancestors were after, these people whose pursuit of happiness paved the way for the waves of 19th century immigrants. Surely this early American Dream was not the power and profit of a Carnegie or the modern fast cars, fast women, easy money stereotype. Instead I imagine they fought for and dreamed of independence and a chance to live a free life with the bounty of the land, a hard but perhaps satisfying life. However, such simplistic dreams and hard labor seem unreal in this complicated and automated age and no solution to my own restlessness. Little did I know that this summer’s migration had taken me on a path that my own ancestors had trod two centuries before. The route led this first generation of Hinchmans from the Maryland shore across the Virginian Blue Ridge and deep into the Mountains of West Virginia sometime in the 1780s, and would lead me to some well sought after answers in the 1980s. Those same West Virginian mountains now loomed close in over the dashboard and the Blue Ridge was still visible in the rearview. I, myself, had come down out of Maine headed towards a new career in Colorado. Two cars and one month later I was only as far as New York City, having been forced to stop and earn some money on the way. Traveling on through the mid Jersey wastelands four weeks later I wondered cynically about the fabled American Dream. I was as free as the wind, but my wallet was thin and there was little in the land that I wanted to call my own. A stay with a friend in Maryland lifted my spirits and I turned west to visit some old family friends in Princeton, West Virginia. With each rise in altitude and passing mile I felt both relief and excitement. The beauty of the land and undeniable power of the mountains made me forget all about my little self. I pulled into Princeton late, but my hosts, Dave and Ginny, and I stayed up past two with excited talk. They had found traces of my family history in the region and the place names jibed with my memory of my father’s research into our past. We planned a fishing and researching trip for the next day. Dave, his son and I set out in the morning in his pickup headed toward Monroe County. The countryside was lovely, rising in mellow hills, green and lush, with long intense ridges running the length of the horizon almost blue in the hazy distance. As we neared the area I pounded everyone we met with questions, the game warden, the convenience store clerk, the gas station attendant …. and the land started coming alive with names and places familiar from old records. I found Nickell’s mill on the map (the Hinchman boys had a history of marrying Nickell girls) and there were still some Gwinns, our early neighbors, in the phone book. We passed through the small towns of Union and Peterstown and through crossroads named Pickaway, Shady Grove and Wolf Creek, all names mentioned in the records. Adrenaline crept like ancient spirits into my veins. My eyes were glued to the land, and the hills rippled and rolled away from sight. A squall hit but the rain failed to dampen my spirits. Instead the water washed the roads clean and sharpened the already brilliant contrast between hill and sky. The truck wound through hollows, high on the ridge tops and deep along creek beds, past rotting trailer homes and ancient clapboard places with stone foundations and log outbuildings. It seemed as if every flat spot in those impossible hills held a home of some sort, in one or another stage of decay. Corn, soybeans and weeds grew in the fields and the creeks held promise of trout and smallmouth, but we had forgotten all about fishing. Wolf Creek was but a general store, complete with rusted gas pumps, ancient ads tacked to the walls and antiquated notices, brown with age, in the windows. Three old boys and a hippie were talking up on the porch. As I stepped up I was met by toothless grins, gristled leather faces and long hair in beads. Even in the midst of all my excitement I couldn’t help wondering at this strange sight. Nervous now, I asked the group if they knew if any of the Nickell or Gwinn families were still around. Dave and I had reasoned that any one of these families could lead us to the old Hinchman place. No luck, except for some distant Gwinn who lived far off. A wave of heat passed through me. Man oh man I thought, I found it. I really found it! “Where is it, how do I get there, what were they like?” Questions piled out of my mouth in one breath. The old boys scrambled to answer my questions, giving out names, directions and memories all at once. In no time I was as confused as I was excited, while they were having trouble keeping their facts straight between them. Finally Leather Whiskers led us to a back road that headed over the shoulder of Wolf Creek Mountain to the next valley over. He stopped his pickup at his gate and came over to my window to give us directions again. So this old man, whose name I didn’t know, and who about made me cry, welcomed me home to a place I’d never been and made me determined to live up to all that he had said. My eyes ablaze, I looked across the hills to Wolf Creek Mountain. It was just a wooded knob, but it commanded your attention. Ancient and gentle, it soothed my jittered nerves. Surely they called that mountain home, I thought, it was and is the central landmark. “Home,” I tried out the sound of it on my tongue. “Home.” I’d never felt any sense of belonging that tied me to a place. I’d never even seen the graves of my ancestors. Looking around, I thought about the blood in this land. I could feel the land rising in my blood. I felt a sense of pride that these early folk had chosen such a wild and beautiful land, and now the mountain beckoned to me. Here was none of the alienation and confusion of my suburban home, none of that temporary feeling of my travels. We wound up and around, tortuously slow. The road was a single lane and it clung to those wild West Virginia hills banked on either side by wildflowers and wood fences. Yet we were still too high up on the ridge. The earliest settlers would have taken the bottom land down on the creeks off the river. Further on we passed Luther Hinchman’s farm, a modern place and of little interest. Finally, we came down upon the Creamery church, an old clapboard place with two doors, one for the men and one for the women. The original lead glass glittered in the sunlight, rough and hard to see through. No graveyard, but we were now back down in the valley where they would have settled. On the bottom land past the church the corn stood tall and there at the end of the field was a two storey white clapboard house with porch and balcony, both graced with delicate lattice work. The house seemed ideally situated, but on closer inspection it looked crooked, as if one corner had slipped off the foundation, and in bad need of repair. An old man stood in the yard and I got out to meet him alone. “Hi, are you the owner of this place?” I asked. “No, I’m a guest of the owner,” he replied. “My name’s Steve Hinchman,” I said, offering my hand. I cringed. Four years too late. Damn! I wanted to go inside, but I jolted out of my excitement realizing that it was someone else’s home. A blonde woman came to the door and explained that her husband, who knew all the history, was not home, but we were welcome to look around and to visit the grave. Dave and I roamed the farmyard marveling at what was once a very prosperous farm in rough country. Everything was made from hand hewn timber. The barn was a massive structure, two and a half storeys high and covering many square feet. The second level was held up by whole trees laid lengthwise across the ground floor ceiling timbers. The building was full of bailed hay and rusted farm implements. A head off a deer carcass hung on the back wall. Standing there we were awed by the labor that must have gone into the building. They would have been strong and willfull people. My mind drifted in time to the image of London, in the 1730s, a merchants house filled with squalling brats. William, one of the younger children, would have run away, as family tradition has it, around age twelve to be a cabin boy on a British ship. He started his drifting young and wandered for many years, restless and full of dreams, about like me. I grinned. I tried to picture this ancestor of mine. By 1760 I know he was a boatswain on a British privateer in the Gulf of St. Lawrence at the siege of Quebec during the French and Indian War. He was in his thirties by then, probably a veteran of many fights. But this time he was wounded while at the helm, the boat captured and he was imprisoned in a French prison hulk. Luckily he was freed when a British Man O War captured the French ship. A happy reunion with his mates and then parting, for he was put ashore in Virginia, wounded and most likely with little he could call his own. A new life in a new land, but he was not quite alone. An earlier branch of the family, perhaps some distant uncle, had settled in Dorchester Maryland at the time of the Calverts. William went to live in the same county. There he took Elizabeth to be his wife, she a person with no history in our records, but surely a hardy woman with dreams of her own. The couple had three children and cared for two orphan girls, but whether they farmed or fished the east shore of the Chesapeake I do not know. William took to the sea again during the Revolution, serving the state aboard the schooners Molly and the General Smallwood. Did he fight against his old comrades, I wonder, or was he a loyalist? On September 1, 1780 the council of the State of Maryland arrested William for “trading with the enemy” as probably many of the poor colonials had. From an Annapolis gaol three days later a repentant William petitioned the Governor and Council for bail and a speedy trial, claiming that “any declaration by him of his trading with them were made without any foundation in the truth, and in the hour of indiscretion and folly when the behavior, conduct and conversation of the company induced him, greatly intoxicated, to utter sentiments foreign from the truth, and to accuse himself of crimes which he is entirely innocent.” (Journal and Correspondence of the State Council of Maryland, v.5, 1779-1780.) Whatever he was, he was something of a brawling drinker, still full of fight in his late forties. At age fifty five this restless man picked up his family and left his Maryland home of three decades to walk across the Blue Ridge and into the Wild Allegheny Front on the western frontier. Whether he left broken dreams in pursuit of a last chance to take the land for his own, or was run out, a loser of the War of Independence I can only guess. Whichever, it was an incredible venture to risk all or nothing at that stage of the game. They settled on Kellers Creek near Creamery in Monroe County with 175 acres. It was here, at their last resting spot where I now stood, rooted in contemplation. It would not have been an easy life. Danger of Indians was past, but they would have had to carve out a home from the surrounding wilderness, covered in trees like those I had seen in the barn. Yet, it would have been their own, and finally, in the twilight of their years with children and grandchildren surrounding them an answer to their lifelong dreams. Looking up to the crown of Wolf Creek Mountain I knew why the old man and his wife chose to lie here in this isolated West Virginian Valley. The power of those two people reach across the centuries and gave me the strength to dream my own dreams again, to find my own American Dream. They lifted me up to walk up the high knob which rose above their meadow. On the way up I saw ripening hickory nuts, blackberries sweet on the vine and blue ridges sweeping across the sky. I realized that William and Elizabeth had no more claimed the land than I could now. It claimed them just as it was capturing me. How beautiful, I thought, to live and die here in this wonderful place. I remember every moment of that day, every detail on the horizon, every beautiful breath in the excitement of the discovery that I really do belong in this land we call America. And I feel ever more strongly the urge to let my sweat and blood touch the soil, to recapture for myself William and Elizabeth’s American Dream of a sweet loving hard life in the bounty of the land. 1. CAPTAIN DANIEL HENCHMAN: was born ca 1627 in England and died 10-15-1685 in Worcester, MA. As little is known about Daniel’s roots, most writers relate only that he spent some time in Ireland; came to Boston in 1666; was an usher at the Old Latin School; was a freeman in 1672; and was appointed Captain on 6-24-1675. Capt. Daniel was involved in many activities as a merchant; a brewer; a real estate promoter; a banker; a lawyer; a farmer; a soldier, and member of the Old South Church. Two “memorials” – Henchman St., Boston and Henchman St., Worcester – are named in his honor. Daniel mar (1) 3-1-1653 SARAH WOODWARD. Sarah was bap 9-5-1627 in London, England and died ca 1670 prob in Worcester, MA. Children: Hannah; Richard; Hezekiah; Nathaniel; Susanna; William. Daniel mar (2) 2-26-1672 MARY POOLE. Mary was born ca 1660 and died ca 1706. Children: William; Jane; Daniel; Mary. Principal sources for the Daniel Henchman family are the following: The Henchman Family; Daniel Henchman, Founder of Worcester; and James Savage’s A Genealogical Dictionary of the First Settlers of New England. Additional sources are William M. Clemens’ American Marriages Before 1699 and Boston Vital Records, 1630-1699 William S. Appleton, ed. 1. EDMUND HINCKSMAN: was born ca 1607 in England and died 10-27-1668 in Chelmsford, MA. His named has been spelled many different ways – Edmund; Edmond; Edward, Henchman; Hinchman; and Hincksman. Edmund mar ELIZABETH … about 1628 in ?England. Elizabeth was born ca 1605 in England and died ca 1674 probably in Chelmsford. Elizabeth m (2) Rev. John Fiske. 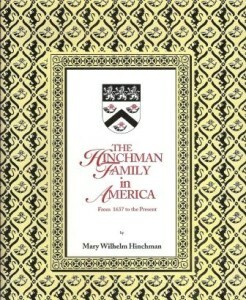 Several sources [not primary evidence] for Hinchmans in the Colonial period are James Savage, A Genealogical Dictionary of the First Settlers of New England; The Henchman Family; Frederic G. Mather, Refugees of 1776 from Long Island to Connecticut; Vital Records of Chelmsford; and Daniel Henchman, The Founder of Worcester. Family members – Rev. Philip Evaul and Charlotte Hinchman Oselador – contributed information for The Hinchman Family in America. 2. MAJOR JOHN HINCKSMAN: (s/o Edmund and Elizabeth Hincksman) was born ca 1636 ?Eng and died ca 1688 Flushing, Long Island. John m (1) 8-10-1660 Boston, Elizabeth, d/o Thomas and Martha Emmons. Children: John; Robert. John (2) ca 1669 Sarah … . Sarah m (2) 7-2-1696, James Clement. The will of Sarah [Hinchman] Clement, widow of Flushing, Queens Co., NY, dtd 6-15-1725, pvd 9-8-1727 named bene. as Elizabeth Doughty; Thomas Hinchman; Hannah Thorn; Mary Willett; Joseph Hinchman; Margaret Clement; and Bridget Thorn. Sources for Major John Hinchman include: James Savage, A Genealogical Dictionary of the First Settlers of New England; Frederic G. Mather, The Refugees of 1776; and John Clement, The First Emigrant Settlers of Newton Twp. Family members – Rev. Philip Evaul; Richard M. Hinchman; and Charlotte Hinchman Oselador – researched the New England Hinchmans extensively. From Long Island, descendants of these Hinchmans settled in other parts of New York; New Jersey; and farther west to Michigan, California, and other states. Sources for these families include John Clement’s First Emigrant Settlers in Newton Township, Gloucester Co., New Jersey; and Frederic G. Mather’s Refugees of 1776. Family members – Rev. Philip Evaul and Charlotte Hinchman Oselador – contributed information. 3. Robert Hinchman of New York: was born ca 1663 Flushing, Queens Co., LI, NY and died about 1709 in Flushing, NY. He was a s/o Major John and Elizabeth Emmons Hinchman. He mar about 1700 to ABIGAIL … They had two sons – Benjamin, born 1-24-1702 and Robert born 3-15-1708. One source for this family is descendant Nelson Hinchman of Pottstown, PA. In 1931, he collected a fourteen-generation family history. 1. WILLIAM HINCHMAN, I: was born about 1733 and died 6-20-1814 in Monroe Co., VA-WV. William and his wife Elizabeth are buried on the Monroe County farm where they settled in the late 1700s. William married ELIZABETH KIRWAN. Elizabeth was born about 10-2-1736 and died 5-1-1828 in Monroe Co., VA-WV. 2. William Hinchman, II: s/o William and Elizabeth Hinchman, was born 2-28-1768 Dorchester Co., MD and died 11-19-1851 in Logan Co., VA-WV. He mar (1) 5-6-1793 Mary Ann Perry ( 5-2-1775, d 1-15-1832). She was the d/o John Perry, Sr. William mar (2) 3-27-1832 Logan Co., VA-WV Nancy Stollings (b 4-12-1801). Sources for this large family include Ragland’s History of Logan County, W. Va 1896 and the research of Corinne Hinchman McNamara. 2. John Hinchman: s/o William and Elizabeth Hinchman, was born 10-22-1773, Dorchester Co, MD and died 1-15-1844 in Monroe Co., VA-WV. John m (1) 12-11-1794 Sarah Vincen (b 1-30-1773, d 8-27-1820). John m (2) 10-4-1821 Barbara Longaker (b 5-8-1787, d 7-19-1830). John m (3) 8-14-1832 Eve Ellis (b 3-20-1796, d 2-2-1888). 1. JOSEPH HINCHMAN: was born 5-10-1831 in Allegheny Co., PA and died 4-29-1916 in Randolph Co., WV. Joseph married (1) CAROLINE RIFFLE about 1858 probably in Randolph Co., WV. Caroline was born 3-8-1838, Randolph Co., VA-WV and died 9-5-1889. Sources for this family including the following family members: Joan Hinchman Gibson; Harold Hinchman; William Grant Hinchman; and Kevin H. Williams. Children: Mozelle, m O. H. Perry Kittle; Joseph E., m (1) Ida Pritt, (2) Dollie L. Daniels; Molly H., m (1) Hamilton Leary, m (2) Toll Robinson; Minnie A., m John H. DeWitt; George W., m (1) L.Pritt, (2) A. Shannon, (3) M. Hamlin; Benjamin F., m Lucretia Bennett; Ulysses G.; Daniel; John S, m Amy P. Pritt; Ogustus “Gus”, m Stella J.Polling; Blaine. 1. HENRY HINCHMAN: was born before 1775 in New Jersey and died 9-1-1834 Mahoning Co., Ohio. Henry married RUTH … prob in New Jersey. Ruth was born ca 1774 in New Jersey and died after the 1850 Columbiana Co., OH census.